Not going out to face the bustle of Black Friday Shopping? You won’t find me out there either! I want to stay home and play a family game, I might even do some online shopping. I will be looking at my list of naughty and nice and deciding who will be getting a good lump of coal and who a shiny wrapped parcel. Well, I have a sleigh but no reindeer so maybe the Santa routine is not for me. 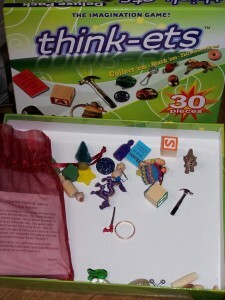 I have been playing with Think-ets with various age groups and want to share with you that we have had a lot of fun! With multiple game choices and the easy convenience of a small bag to carry with me this Deluxe Set is a big hit from grade school to senior citizens. Mixed ages is stimulating because everyone brings their imagination and the stories take some fun turns. Embedded in the game are teachable moments, a famous quote, a reference to another place and time. Twice without prompt student groups came up with Romeo and Juliet story versions. Playing concentration by laying the pieces out and removing one was a favorite. I could see how sharp the kids were as they studied the array of items and tried different techniques to keep the mental list. 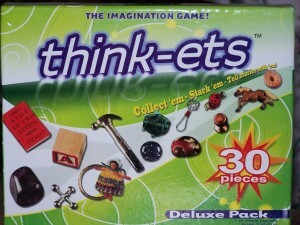 Think-ets will be on my list of things to order so that the fun and stories continue. 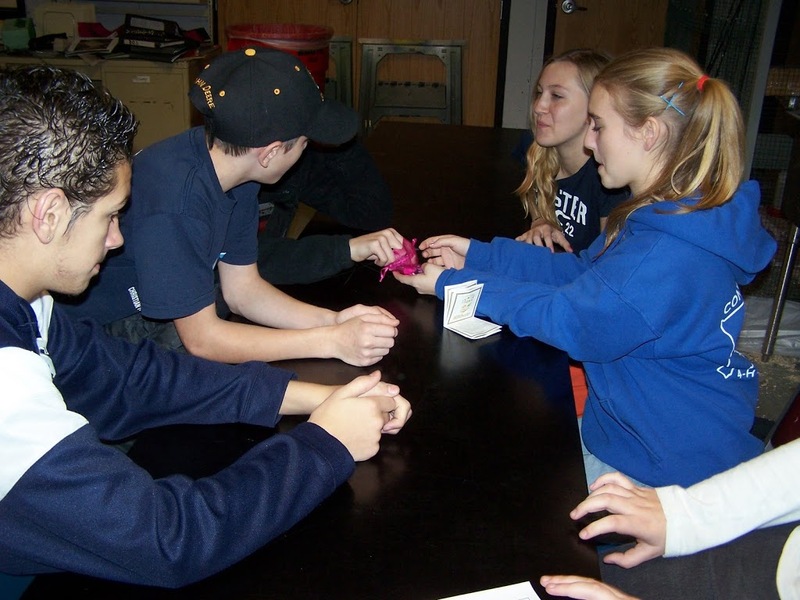 I am appreciative of the students who happily volunteered to play games and let me watch the play proceed. This was the perfect way to spend the last few minutes of class today. Now I will be looking forward to the next time I’m in a groups setting and we can play Think-ets from Think-a-lot Toys in Boulder, Colorado. Subscribe or Follow today if you want to receive the upcoming reviews of more games and CD’s, Thank -You!